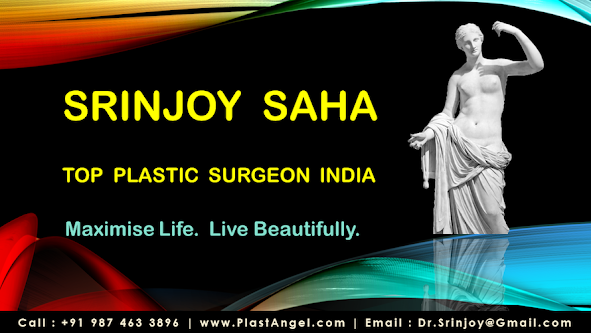 Dr Srinjoy Saha, Top Plastic Surgeon in India. Apollo Gleneagles Hospital, Kolkata, India. Clinical Tutor in Plastic Surgery. Apollo Hospital Educational & Research Foundation. Tutor in Surgical Sciences Program. Top Plastic Surgery by Dr Srinjoy Saha. For details, please click here. Nil Ratan Sircar Medical College, University of Calcutta, India. Institute of Post Graduate Medical Education & Research, University of Calcutta, India. Tata Department of Plastic Surgery, Grant Medical College, University of Mumbai, India. The Royal College of Surgeons of England, London, UK. Brigham and Women's Hospital & Harvard Medical School, Boston, USA. Grant Medical College, Mumbai, India. Plastic Surgery Foundation & American Society of Plastic Surgeons, USA. American Society for Aesthetic Plastic Surgery, USA - Finalist. Gold Medal In Plastic Surgery. Best Paper Award in Surgery. Association of Surgeons of India - National Conference. National Council of Educational Research and Training, India. Association of Minimally Invasive Surgeons of India. Dr Srinjoy Saha is among the best plastic surgeons in Kolkata, India and listed amongst India's top doctors. He has a passion for achieving best possible results for all his patients and a profound commitment to excellence. He has trained in the best places for medical education in the world in his pursuit for excellence. 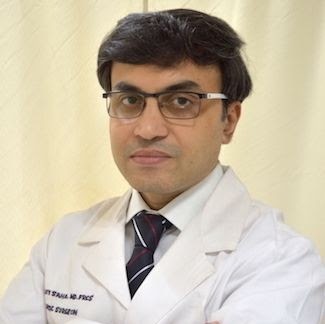 He studied in Harvard Medical School Hospitals, Cleveland Clinic Ohio, Emory University Atlanta, Royal College of Surgeons of England, University of Mumbai and University of Calcutta. He has received prestigious international awards for excellence from American Society of Plastic Surgeons, Plastic Surgery Foundation, American Society for Aesthetic Plastic Surgery, Apollo Hospitals Foundation, University of Mumbai, Rotary Club International amongst various other organisations and universities. He had a brilliant academic career as well. In his high school he received the prestigious National Talent Search Scholarship Award from National Council of Educational Research and Training, India. He was awarded numerous prizes and awards all through his medical education years. After completing M Ch in Plastic Surgery from University of Mumbai, he was awarded the prestigious University Gold Medal for securing the topmost position with record marks in the University. It is a rare and prestigious honour, and he remains the only person to receive this award in the last twenty years. He performs different types of specialised cosmetic and reconstructive plastic surgery. He has expertise in the latest techniques in cosmetic plastic surgeries like liposuction, tummy tuck, body contouring surgery, scar correction and scar removal surgery, breast lift, breast reduction, breast enlargement, breast implants, breast reconstruction, fat grafting, obesity surgery, hair transplant, brow lift, face lift, face reconstruction, nose improvement and nose reshaping surgery, ear reshaping, laser rejuvenation and laser resurfacing, neck lift, plastic surgery in men, mommy makeover, dimple creation, lip enhancement, lip reshaping, botox, peels and fillers. He also performs reconstructive plastic surgeries of the hand, face, breast, nose and body for patients admitted under him at Apollo Gleneagles Hospital, Kolkata India, with very high levels of success. Apollo Hospitals has recognised his surgeries for clinical excellence amongst the works of all plastic surgeons across India. Dr Srinjoy Saha is an accomplished surgeon, scientist and author, besides being an artist and a great individual. He is a perfect combination of skills and knowledge. He is renowned for achieving stunning results in cosmetic and reconstructive plastic surgery. Great results and finesse of his plastic surgery is possible due to his emphasis on beauty, balance, poise and symmetry. He specialises in performing plastic surgery with hidden and minimal scars. Bringing home to Kolkata India best and latest techniques of treatment from Harvard, Cleveland, Emory and other great places of medical education, he is dedicated to providing each of his patients the very best of medical care. Treating numerous film, television, fashion industry and foreign patients has made him aware and keen on achieving best plastic surgery results with minimal scars. He is dedicated to providing the best natural looking result to each of his patients. He practices in Apollo Gleneagles Hospital, Kolkata India. It is the best hospital in Kolkata and Eastern India and a Joint Commission International accredited hospital. He also operates in some more affordable day-care setups to lower costs for his patients. He believes in giving back to the society and often reaches out to the poor through surgical camps. He ensures extremely low cost services whenever possible for needy patients. He is concerned about the inequity of of medical and cosmetic industry as a whole. His practice is deeply rooted in ethics and morality. He ensures complete confidentiality of all his patients. He guides and educates his patients with the different choices that they have while seeking plastic surgery. He encourages all his patients to do their homework, ask questions and always insist on the very best for their plastic surgery. Over all else, he enables all his patients to think and make intelligent, educated decisions. Dr Srinjoy Saha has been featured several times in the news media, both in English and Bengali, both in print and television. He has been invited to write and speak on liposuction, body sculpting, hair transplant, diabetic foot ulcer treatment, scar revision and treatment, amongst others. All of these are reasons and evidence that he continues to strive for a very high level of excellence for himself, his work, and patient care. Feel free to contact his secretary, Gautam at +91 987 463 3896 or email his office at dr.srinjoy@gmail.com for your queries or concerns.